Of all the possible cinematic trends of 2014, who could have possibly foreseen that the return to prominence of Alejandro Jodorowsky would be among them? The Chilean-born filmmaker became an icon to many moviegoers when his second feature, the trippy-hippie western "El Topo" (1970), became a cult sensation and one of the early hits of the then-emerging midnight movie scene. Since then, his output has only amounted to a small handful of films, including the bizzaro masterpieces "The Holy Mountain" (1973) and "Santa Sangre" (1989). His last film, "The Rainbow Thief," was completed in 1990 and only released a few years later in France in a version that he personally disowned. In the ensuing years, there were rumors of projects that never came together for one reason or another but in recent months, Jodorowsky seems to be all over the place. Earlier this year, there was "Jodorowsky's Dune," a fascinating documentary chronicling his wildly ambitious attempt to bring Frank Herbert's classic sci-fi novel to the screen with visual designs by the late H.R. Giger, music by Pink Floyd and a cast that would have been led by no less a figure than Salvador Dali. Now there is "The Dance of Reality," a semi-autobiographical work that demonstrates that age has most certainly not mellowed him in the slightest in terms of audacity even while presenting the most personal and emotionally direct work of his career to date. The result will no doubt polarize viewers, as has been the case with his other major works, but it will certainly go down amongst those who see it as one of the most unforgettable films of this or any other year in recent memory. "The Dance of Reality" offers viewers a semi-autobiographical look at his youth in the remote Chilean town of Tocopilla in the early 1930s with the filmmaker himself serving as both the narrator and as an on-screen guide. The first half focuses on young Alejandro (Jeremias Herskovits) and his complicated relationship with his parents—father Jaime (Brontis Jodorowsky, Alejandro's son) is a Stalin-obsessed brute consumed with making a man out of his seemingly effeminate son by any means necessary; mother Sara (Pamela Flores) is an overly doting type whose every word is literally delivered as an operatic aria. In the second half, the focus shifts to Jaime and his dramatic conversion from communism to radicalism that leads him to abandon his family to set off on a quest to assassinate the hateful military leader, Carlos Ibanez (Bastian Bodenhofer), a mission that threatens to leave him both physically and spiritually crippled as a result. 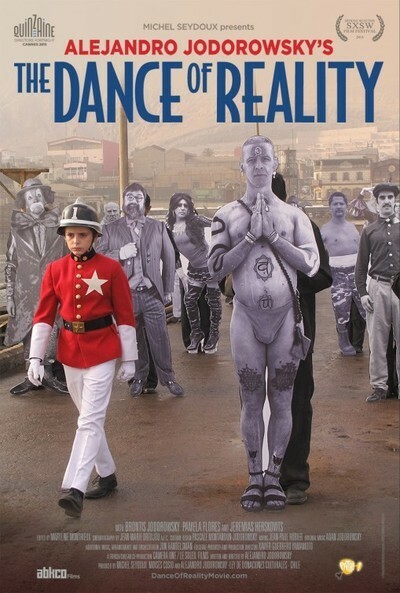 For those with a working knowledge of Jodorowsky's past efforts, the basic elements of "The Dance of Reality"—ranging from troubled father-son relationships to a fascination with victims of various physical afflictions running the gamut from mutilation to dwarfism—will not seem unfamiliar. What is different this time around is that, for arguably the first time in his career, Jodorowsky has found the confidence to communicate his ideas to audiences in a direct and unapologetically emotional manner without falling back on his usual distancing techniques such as surreal imagery and extreme violence that made a film like "El Topo" so radical in its day (and which, to be frank, make it a little tiresome to endure nowadays). As wild as the proceedings get at certain points, they are grounded in a sense of reality this time around that lends the material a surprising amount of dramatic heft. This is especially evident in the second half of the story, which is nonsense in the broad strokes (Jodorowsky has admitted that his father never really tried to kill Ibanez) but which is nevertheless a powerful and deeply felt attempt by an artist to come to terms with his complicated relationship with the father that he clearly hated and loved in equal measure. This is not to say that Jodorowsky has grown safe and soft since his last film. Right from the gorgeous prologue that finds the filmmaker meditating on the necessary evil of money (no doubt an allusion to his difficulties in finding financing for his projects over the years), "The Dance of Reality" is filled with enough visual astonishments to fuel a dozen ordinary films. What makes them so memorable is that no matter how bizarre Jodorowsky gets with his imagery, he is not just offering up empty cinematic calories. When he presents one of his cinematic splendors, they mean something to him and the story that he is trying to tell, even if exactly what that is may not be entirely obvious at first glance. There is a scene early on, for example, in which an upset Alejandro throws rocks into the sea and it responds with a giant wave that deposits thousands and thousands of sardines on the beach. From a technical standpoint, the sequence may not be exactly state-of-the-art thanks to the somewhat dodgy CGI but it is an image of great significance to Jodorowsky; not just a bit of eye candy. I am certain that I will retain that image in my mind long after I have forgotten the rest of this summer's box-office behemoths. The two halves of "The Dance of Reality" arguably do not mesh together properly and it's debatable that the story doesn't quite add up in the end. Such things are hardly the point when it comes to the films of Alejandro Jodorowsky. He is a filmmaker who is far more interested in taking viewers on a real journey and supplying them with images and ideas that they have never experienced before in their moviegoing lives and which will continue to stick with them long into the future. As this film proves, not even a quarter-century of inactivity has been able to curb that desire, and we as moviegoers are all the better for it.